The latest intel on spy gadgets and skills for junior spy kids is collected in this top secret file. What's new? For Your Eyes Only! Whenever we add or change pages, or want to share some news from the spying community, it will be listed here, and simultaneously added to the accompanying RSS-feed (What's an RSS feed?). Have What it Takes to Become a Spy? Want to become recruited by a spy agency? They are looking for specific character trades and skills... do YOU have what it takes? Continue reading "Have What it Takes to Become a Spy?" 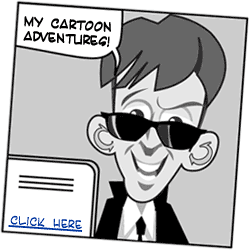 Spy Cartoon: The Adventures of Mister E.
Continue reading "Spy Cartoon: The Adventures of Mister E. "
Are you up for Covert Spy Missions? 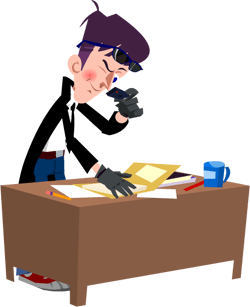 Continue reading "Are you up for Covert Spy Missions? " Disguising is an important part of any spy's skill set. You need to be able to disguise yourself to get away from enemy spies, or to blend in where you are spying. 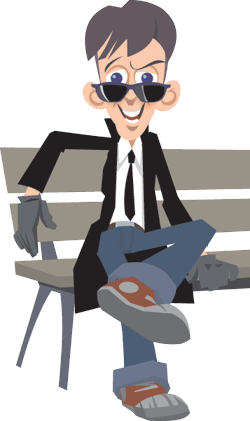 Continue reading "Spy Training Mission: Disguise Yourself"
Hey Spy kid! Subscribe to Messages from Uncle, to receive espionage news in your mailbox. Continue reading "DEBRIEF - Mission Rid-e-Cool"
"Robin Hood's arrow rides on all 4s." That's it. Please stand by for more info. Continue reading "Update Project Rid-e-Cool"
Continue reading "Project Rid-e-Cool - TOP SECRET"
Continue reading "Dismantle the missiles! (15 Puzzle)"
Spy Word Search: a Hidden Message? Continue reading "Spy Word Search: a Hidden Message?"